Many of you will have shared the same New Years resolution. This is going to be the year you get in to shape. You let yourself go a bit last year, maybe you’re going to show that ex what they’re missing, or, maybe you got a bit too friendly with the desert menu in 2015 and you need to work it off. Whatever your reasoning and goals it’s always handy to have a bit of gadgetry to help you out. So, I got my hands on such a fitness gadget, which can help you achieve those goals. The Garmin HRM Tri. What’s that? Well it’s a heart rate monitor which is designed for the triathletes among you. ‘Yeah, yeah. 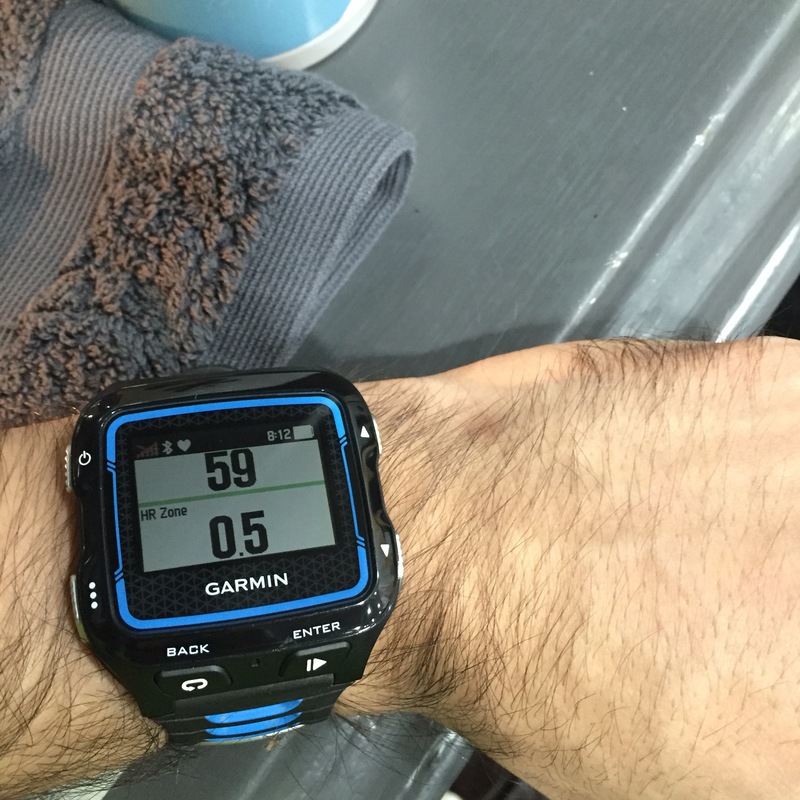 How does a heart rate monitor help me train harder? Plus, I’m not a triathlete. 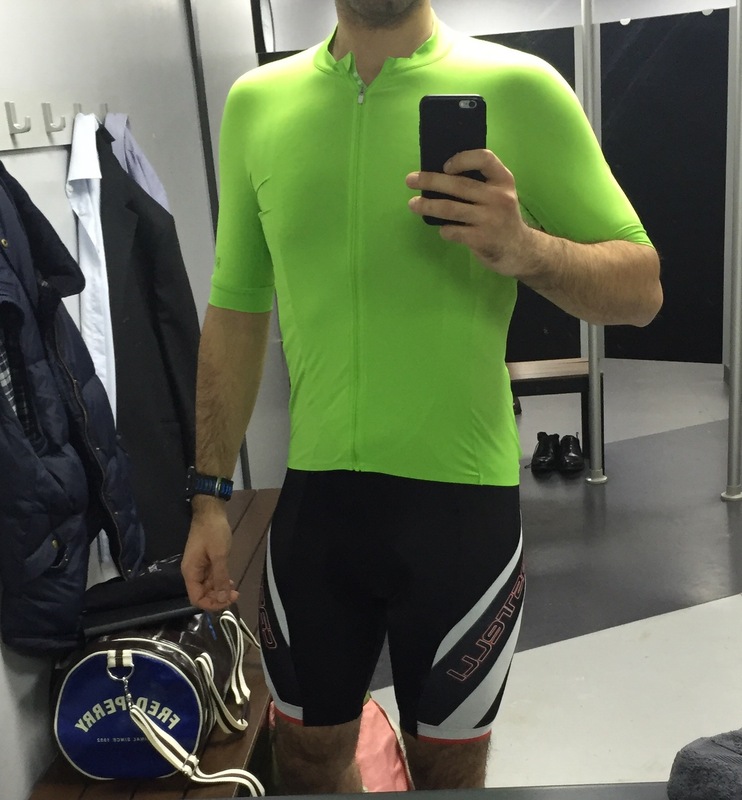 I’m a cyclist.’ I hear you ask. Well soon as you did ask, and I didn’t purposefully put that question there to help me carry out the rest of this blog – it helps you work in ‘zones’, if you’re running, cycling or swimming. Knowing your heart rate and the ‘zone’ you’re working in, combined with how you’re feeling is all important to your overall goal… Getting fit. Most of the fitness gadgets I test are tested at a neutral playing field, my spin class at Cyclebeat. What does it look like and how does it work? Well, as heart rate monitors go, it’s fairly inconspicuous, the “bulk” of it is about an inch in length and it doesn’t stick out much, at all. Really quite descrete. Wearing it under your top, which you should do is not an issue. See if you can spot it on me. But, please, excuse the garish green top matched with black white and red shorts. I know the shorts and top dont match, deal with it. You can get away with wearing it and no one would really know. You’re an undercover gadget lover, that’s fine by me. (So am I). The way it works is a bit of a stumbling block, for me. You have to partner it to your Garmin Forerunner 920XT watch. If you could partner it to your phone, allowing you to keep a track of your exercise over a period of time, that would be much better. Not having to buy the watch itself which is £311 on Wiggle. Or even being able to download data to your computer, that would work just as good. Partnering up is easy enough though, it’s in the watches settings and it’s all linked via BlueTooth as long as the watch is within three meters of the monitor. And unless you’ve got freakishly long arms, then there shouldn’t be an issue. So – in terms of it being a gadget that only you know about, without looking too brash or like you’re taking things too seriously. It gets a decent score for being descrete and the Garmin colours look nice too. That strap, it’s got to be pretty snug, right? Well, that was my concern. When I first put it on I thought: ‘hmmm, this is going to restrict my breathing.’ Actually, I barely even noticed. The pain in my legs was far worse. Once I got over the fact I was doing a gadget review the fact I was wearing a heart rate monitor didn’t even enter my brain. It scores well here. The strap is very giving but not so that it falls around your waist. There’s even adjusters for the larger sized person. What are the pros then? What I did love was that I was able to see how I was working in ‘zones’. You hear people talking about this all the time but you’re able to judge what you’re doing better when the numbers are on your wrist. It was actually really effective, for reading my heart rate during my workout. I knew how hard I was working by how my legs felt but I never before was able to see how hard my heart was working. The more I was able to understand how that muscle was working the more focused my training became. After all if your heart isn’t working properly, you’ll probably pass out and the next thing you’ll see is flashing blue lights. At least they’ll know your heart rate though. So in terms of reading your heart rate, again, it scores well. Well the blatant one is that you need a £300+ watch strapped to your wrist. What’s that about? Let me pair it to my phone and store the data there. There’s no where to store my data?! Without the watch it’s just a snug fitting strap. How am I meant to see if I’m improving if I can’t store my data? For me, the overarching issue is that you can’t use the heart rate monitor without the Forerunner 920XT watch. That is a big issue. Other than that, it was pretty bang on. So, are you buying one? There’s no contesting the fact that indeed it is a heart rate monitor, it looks good and it does indeed read your heart rate. It costs £99.99 from the Garmin website. So it’s not cheap on its own and then there is the price of the all encompassing watch. Yes if you bought the HRM Tri, Forerunner XT920 watch and also a Garmin Edge bundle I can really see the advantages. As a gadget it’s easy to use, looks good, it’s descrete and does what it says on the tin, I can’t fault it there. However, I think it’s a little too rich for my blood. Overall I’ll give it 3 revolutions of the pedal out of 5. 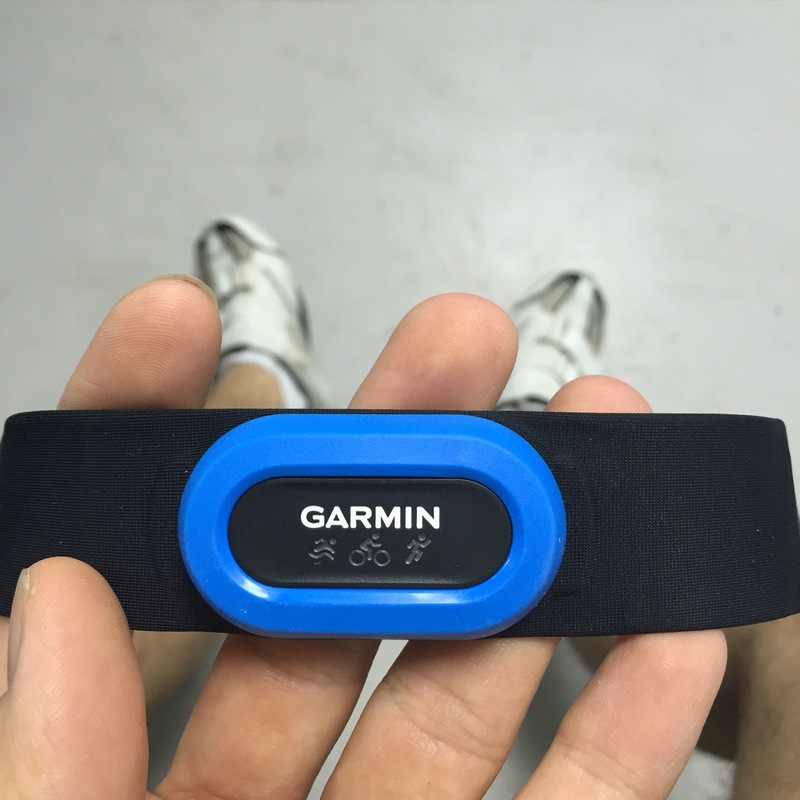 If you would like to buy the Garmin HRM Tri, you can do so here. And if you’d like to follow me on Twitter, you can do that, here.